Rudbeckia hirta | Horticulture Talk! Taking Your Garden to Rustic Levels: Wildflowers! I think that wildflowers have to be one of the loveliest gifts on this Earth. Their changing panorama of colors, shapes, sizes and heights provides delight throughout the seasons. Wildflowers can be used anywhere — in the home landscape, they are ideal for creating colorful beds and borders, as well as offering a lower-maintenance alternative for large areas or replacing grass. Wildflowers can be planted to cover large, open areas or assist in the recovery of a landscape that has been damaged or destroyed by the actions of people, a natural disaster, or the spread of invasive plants. So what exactly makes a flower a ‘wildflower’. It is not an exact term nor is it well defined. Some people say a wildflower is a plant that was not intentionally seeded or planted and grows without cultivation. Others classify a wildflower as any plant growing without the help of man regardless of the country of origin. Still others define a wildflower as a plant found in a specific geographic area that was grown from seed or plants also from that area. 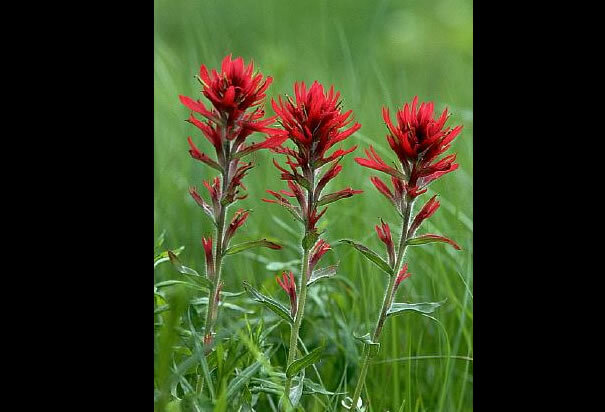 Wildflowers and other plants that were growing before European settlement in what we now call the United States, Canada and Mexico are called native plants or indigenous species. Other plants, often referred to as exotics or aliens, were originally brought here from another part of the world. Many exotic species including flowers, grasses, trees and shrubs are among our favorite garden plants. A few, including some wildflowers, have escaped and become established as part of a local environment or naturalized. Some exotic species have even become invasive and are considered noxious weeds that need to be eradicated. A garden of wildflowers offers benefits to both the gardener and the environment. Once established, properly chosen wildflowers require less maintenance than traditional landscape plantings which can mean less watering, fertilizing, pest control and mowing. Some plants have deep root systems that prevent water run off and soil erosion, and enable them to withstand drought. Their growth also brings earthworms and beneficial soil microorganisms to enhance soil health. And colorful blossoms can be arranged into lovely, casual bouquets that brighten the home. Flowers provide nectar and pollen sources for bees, butterflies and other pollinators, while ripened seeds are a food source for birds and wildlife. Current research suggests that native plants and flowers might be more attractive to native bees than exotic flowers. Even a small area in a garden or landscape planted with wildflowers that bloom at varying times throughout the growing season helps attract and support pollinators. Many of these beautiful yet hard-working plants are equally at home in garden beds and borders as they are in larger wildflower plantings and restoration projects. Purple coneflower (Echinacea purpurea), California poppy (Eschscholzia californica), columbine (Aquilegia canadensis), butterfly weed (Asclepias tuberosa), and black-eyed or brown-eyed Susans (Rudbeckia triloba and R. hirta) are among the popular wildflowers planted by American gardeners, all of which happen to be native to the U.S.
© Mertie Mae Botanics LLC and Horticulture Talk!, 2013. Unauthorized use and/or duplication of this material without express and written permission from this blog’s author and/or owner is strictly prohibited. Excerpts and links may be used, provided that full and clear credit is given to Mertie Mae Botanics LLC and Horticulture Talk! with appropriate and specific direction to the original content.